The Supreme Court of the United States in Miranda could never have imagined the profound misconceptions that have arisen about the five components of Miranda warnings and the three prongs of Miranda waivers. Although virtually everyone can confidently recite “you have the right to remain silent,” some arrestees believe in the stunningly false dichotomy that unless they take their chances and talk they will be convicted by their silence. Similar to Miranda comprehension, this chapter utilizes a hierarchical model for Miranda reasoning that builds on arrestees’ basic appreciation of their rights as they apply to persons in general as well as to their own personal circumstances. 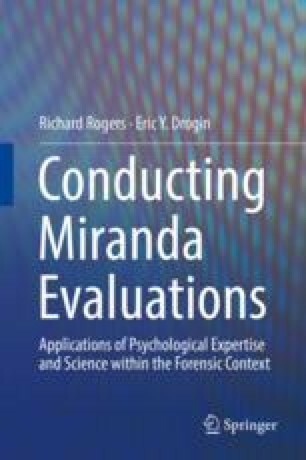 Next, Miranda misconceptions are examined, with an emphasis on how these may impair Miranda reasoning—as just illustrated concerning the right to silence. In addition to avoiding misconceptions, Miranda reasoning requires the ability to consider both sides of a waiver decision in relationship to immediate and long-term self-interests. In particular, arrestees—who are typically unable to think beyond their immediate inclinations (e.g., stop the questioning at any cost)—may not have the capacity for rationally considering the long-term consequences in their thinking and decisions. Alternatively, impulsive or otherwise poor judgement should not facilely be equated with compromised Miranda reasoning. Intelligent waivers must be considered with regard for the totality of the circumstances.